Joost van der Westhuizen was the archetypal Springbok, an Afrikaner whose name became a byword for brilliance, total commitment and supreme physicality. Now the 42-year-old is confined to a wheelchair, struggles with his speech and barely has the strength to hold a sandwich or lift a drink. For the last two years his body has been ravaged by the debilitating effects of motor neurone disease, which has taken control of everything except his mind. That remains as sharp as ever, but his body has become increasingly disobedient, making every day a challenge. 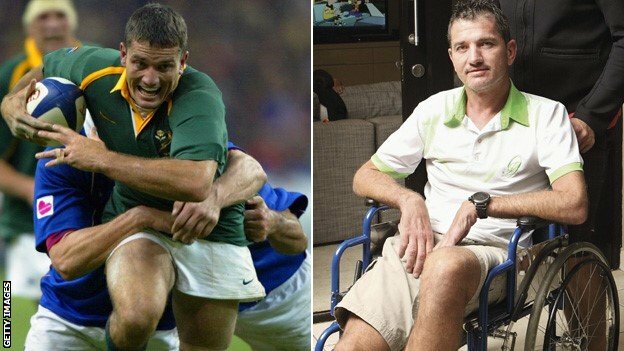 Van der Westhuizen admits he is on his "deathbed", having been given between two and five years to live when he was diagnosed in 2011.